Pickup trucks have become extremely popular these days and with more people enjoying the outdoors in their trucks. 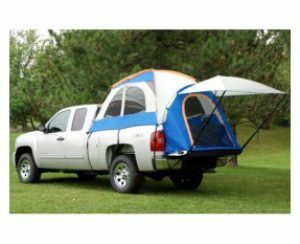 It really makes a whole lot of sense for outdoor adventure equipment makers to add a tent that is designed to be pitched in the bed of the truck. This eliminates the need for a full blown campsite in order to have a place to sleep for the night. Since truck beds vary in size it is important to ensure that you select the correct size of truck bed tent that fits your model truck and truck bed option. The anchor straps hold it in place just like the tent stakes would hold it securely to the ground. There are many different options when it comes to instant tents or truck bed tents. 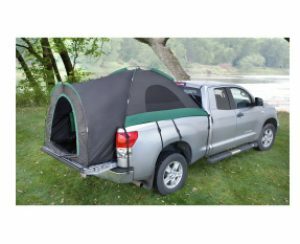 We put together a list of 6 best pickup truck tents and included a review of each of them. Anyone of these would make a great choice as a truck tent for any situation out there. The 110730 Full-size truck bed tent is made from only the highest quality materials and designed to fit any truck with a bed 72″-74″ long. The fabric is rugged, water resistant and the four pole construction is engineered to fit perfectly into the bed of the truck. Large mesh windows provide a great deal of ventilation for those warm summer nights. It is large enough to fit up to two adults comfortably. Rightline Gear designed this tent with a very durable heavy duty 190T polyester fabric that has a water resistant coating which helps the water just bead and roll off the exterior. The four poles are made from a highly flexible fiberglass, but they are extremely strong and help to form the perfect support structure for the tent. It includes an oversized rain fly that completely covers the large mesh windows to help keep the rain out of the tent. The main entrance is a large D-shape fully zippered at the end of the tent. Rightline Gear came up with the perfect design that fits a wide range of makes and model trucks that have full-size beds. 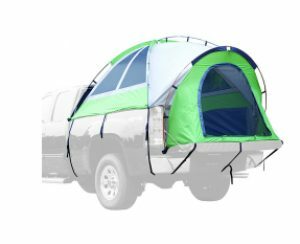 If you are looking to use your pickup as a camper, but don’t want to spend all that money, just pick up one of these tents. 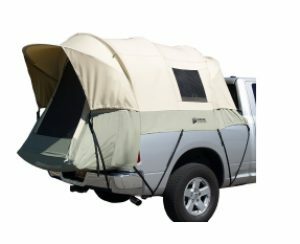 The Backroadz Truck Tent was designed to fit a wide range of vehicles including pickups and SUV’s and comes in 5 unique sizes from 5’5″ x 5’5″up to 9′ x 9′. The tent material features a heavy duty fabric that is both rip and water resistant and features a heavy duty polyethylene sewn in floor. It sleeps up to 2 people comfortably and the four large mesh windows make it extremely comfortable even in the warm summer evening. Napier used a heavy duty polyester taffeta fabric with a coating that makes it virtually rain proof and helps the rain to bead and roll of the outside. The shock-corded fiberglass poles are designed in a domed shape and feature four really large mesh windows that allow for great ventilation. There is a rain resistant rain-fly the covers the top and sides to prevent the rain from getting into the windows. The entrance has an extended storm flap protecting it from direct rain and the wind. Napier designed this truck bed tent to fit a wide range of trucks by offering 5 different sizes for you to choose from in order to be sure that you are able to find the correct model that fits your truck or SUV. Guide Gear designed this full-size truck bed to accommodate up to two adults and has a center height of 63″ and fits in the bed of any truck up to 81″ in length. The quick setup construction allows it to be deployed in minutes and you will be ready to sleep in no time. The fabric is made using only the highest quality materials and is water resistant. The large mesh windows allow for maximum ventilation and a full-size rain-fly keeps out the rain from getting in. The tent is made from a heavy duty 190T polyester material with a water resistant coating that allows the water to bead and just roll off the out of the tent. The four tent poles are made from a shock-corded fiberglass which gives it a bit of flexibility while still be strong enough to support the tent in place. The anchor straps also help to secure it to the sides of the truck.The floor of the tent is sewn in and made from a polyethylene. The Guide Gear Full-Size Truck Tent is a really heavy duty tent that is designed to fit in a wide range of full-size trucks, especially those with longer beds. You cannot go wrong if you were to select this tent. The Kodiak Canvas tent is constructed from an exclusive, heavy duty material chosen for its ruggedness and durability. The poles are made from a high strength material and the framework forms a unique tunnel shape that helps to maximize the interior space. It was designed especially for full-size trucks which have shorter beds like the Ford F Series, Chevy Silverado, GMC Sierra, Toyota Tundra and Nissan Titan. The tent material is made from a heavy duty 100% cotton duck canvas which is both waterproof and breathable. The exterior is coated with a Hydra-shield protectant to keep out the water from getting inside. The poles are all made from a high strength tubular steel material and help to form an extra sturdy framework. It features five full, large windows including one which provides cab access. The tent extends over onto the tailgate when it is fully open which helps to increase interior size. I also have a large, D-shape access door which has a sturdy zipper. The Kodiak Canvas is one of the highest rated of all of the truck bed tents on our and list it would be a great choice for anyone looking for this type of tent. It would be a great choice for your camping needs. 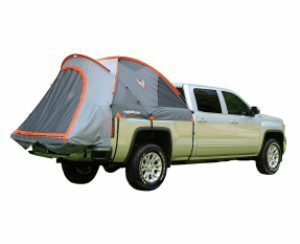 Sportz Truck Tent III is a high-quality tent designed especially for Chevy C&K and Silverado Trucks. 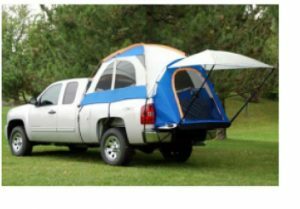 This truck bed style tent was designed to convert the bed of your pickup into a comfortable sleeping area so that you don’t have to sleep on the ground. It is made using only the highest quality materials and features a very large interior with a 5’6″ center height which is perfect for most people to feel comfortable. It sleeps 2 people comfortably and the sewn-in polyethylene floor keeps a good barrier from the bed of the truck. The fabric of the tent is made from a heavy duty polyester taffeta material which has a water resistant coating that helps to cause the water to bead and just run off the exterior of the tent. The poles are made from a combination of fiberglass and tubular steel for both strength and just the right amount of flexibility. There are two large windows which allow a good amount of airflow and there are two additional vents for plenty of ventilation. While the exterior of the tent has a coating, it also comes with a rain-fly which helps to keep the rain off the tent. The Sportz Truck Tent from Napier is good, a high quality tent that is designed especially for the Chevy C&K and Silverado trucks. So if you are in the market for a truck bed tent and have a Chevy pickup, this will be a great choice. The 6′ x 6′ Truck Bed Tent was designed especially for the compact type pickup truck. It is compatible with most of the major brands of domestic and foreign brands of trucks like Ford, Chevy, and GMC, as well as from Toyota and Nissan. It is made using only the highest quality materials and workmanship. The interior is large enough to fit two adults comfortably and has a center height of 4.75′. The tie-down straps are designed to keep the tent from being blown away in a strong wind. 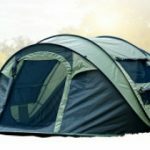 The tent features a heavy duty, water resistant fabric made from 190T polyester with a coating that helps to cause the water to bead and run off instead of penetrating the fabric. The framework is created by using four shock-corded fiberglass poles which are strong and sturdy while remaining slightly flexible. It features two large mesh windows and a large d-shaped meh door on the end. The whole top of the tent and windows are shielded from the rain using the water resistant rain-fly. The Guide Gear 6′ x 6′ Truck Bed Tent was designed especially for the compact style pickup trucks for all the major brands of domestic and foreign trucks. 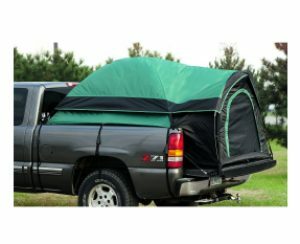 This is a great truck bed tent and would be a great choice for anyone.